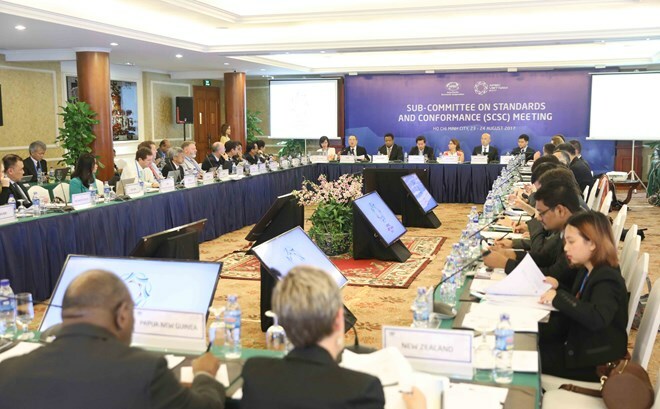 HCM City (VNA) – Bridging gap in economic development and integration of remote areas for sustainable growth in the APEC region is one of the topics to be discussed by APEC senior officials in HCM City on August 24. The delegates will also focus on advising standards, trade facilitation, simplified business registration and incorporation for APEC, and trademark infringement determinations in a border enforcement context. The seventh APEC High-Level Meeting on Health and the Economy is scheduled to wrap up on August 24 after two days of working. There will be a policy dialogue on HPV and cervical cancer, and a cervical cancer expert group workshop the same day. In the Mekong Delta city of Can Tho, APEC ministers and CEOs are expected to exchange views on responsible use of resources to enhance sustainable food production and agri-business. APEC is the Asia-Pacific region’s premier economic forum. The primary goal is to support sustainable economic growth and prosperity in the region.